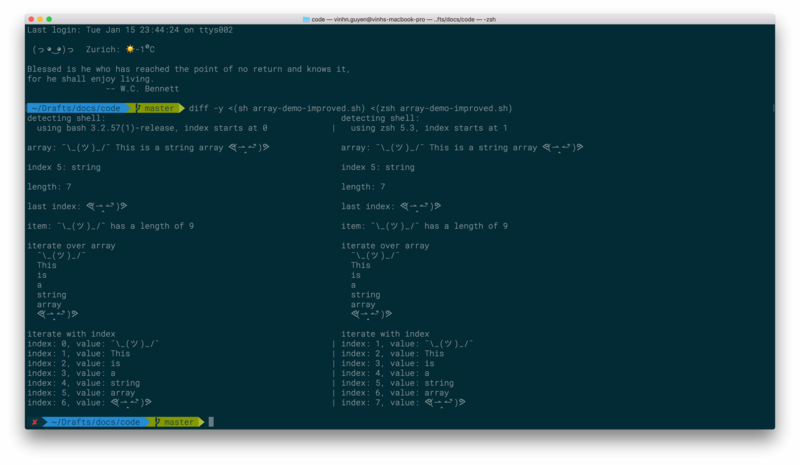 I wrote this example on my MacBook Pro, which has two flavours of Linux Shell: Bash and Z shell (zsh). See a more detailed answer to that problem. Regardless pay attention, if you are using different shells. Iteration with index does not work for the zsh. For the educational purpose, I use the variables INDEX_START and INDEX_OFFSET to accomplish identical results. To compare the two outputs, if your eye doesn't see the difference ＼ ٩( ᐛ )و /／.